How to Password-Protect Free App Lock Itself? 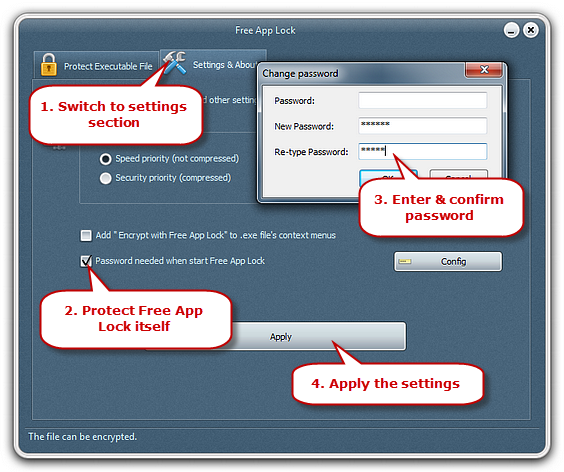 This free application lock not only helps lock other executable programs but also itself. It enables you to add password for this software self so that there’s no other way to run or uninstall it if you have not the password. Failure to provide the correct password prevents the program from fully launching. Launch Free App Lock and click “Settings & About” tab. Check “Password needed when start Free App Lock”. Click “Config” to enter the password in“New Password” and retype it in “Re-type Password”. You can also change the password you’ve set in the “Change password” pane. Click “Apply” to apply the settings.